The new series of collages by Macay opens a complex range of topics and questions that can be discussed in relation to her works. Macay addresses the MENTAL ISLOLATION that she has experienced during her art residency “La Wayaka Current” in San Blas, Panama. Together with 14 other artists from around the globe, they experienced on a deserted island a disconnection from today’s urban life. This sheds a light on the fact that often only through a residency artistic production is enabled nower days. Travelling, alternating locations and no fixed studio have become the rule of working conditions of artists. In the past and in art history, the travels of artists to colonies and tropical islands were intended to search for purity and the origin of arts. Especially the aesthetics of African sculptures and masks helped to overcome classical principles of paintings and to establish modern artistic language. The practice of the unreflected adaptation of artistic forms without knowing their original meaning and function in African tradition has been highly criticized through critical theory and postcolonial knowledge production. This is also the theoretical framework which is fundamental for Macay’s artworks. 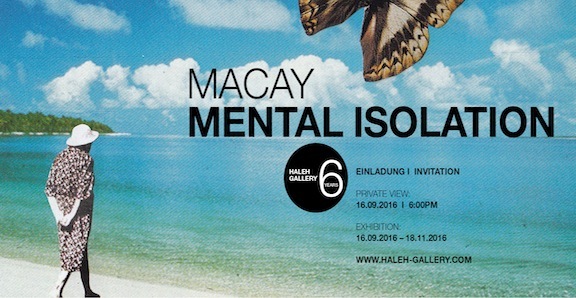 At first glance Macay’s collages present pleasant images and imaginations of the tropical travel destinations for the Western viewer. Through an ethnographic lens the artist questions out-dated modes of representation of the exotic other and deconstructs images of otherness of indigenous people. This is accomplished through the artistic mean of sampling and collage on a structural level and is continued on a thematic level. In close collaboration with the people Macay portrays the community of San Blas and its relationship to the tropical natural environment in her colourful collages. The project illustrates the fiction of the advertised solitude of the paradisiacal landscape and focuses on the life conditions and the erasure of the local people in the media representations to market Panama’s nature as popular destination for the exhausted urban traveller. Macay is going to realize a site-specific mural artwork with the seize 2.30 x 1,70m in Haleh Gallery for the solo exhibition MENTAL ISOLATION. Macay (*1982 Santiago, Chile) graduated from Central Saint Martins, University of the Arts, London. Macay is travelling around the world with stopovers between San Francisco and Taipei. Numerous solo and group exhibitions (selection): “Mirage”, Haleh Gallery, Berg, Munich (2015); “Bucalemu“, Galeria abierta Costanera Center, Santiago, Chile (2014); “11,677,595 km“ , Red Gallery, London (2013); Toronto Art Crawl, Toronto (2013); “Summer(time)“, Galerie Ligne 13 Paris (2010).